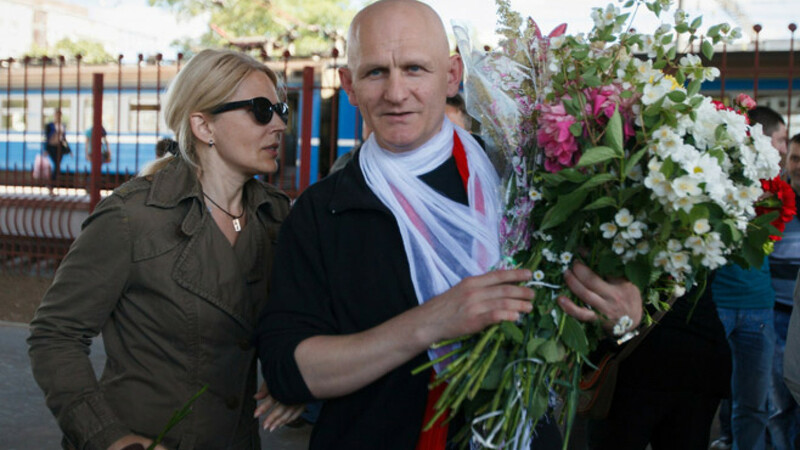 Belarussian rights advocate Ales Bialiatski greeting his wife on Saturday after having spent three years in prison. A prominent Belarusian human rights activist was released from prison Saturday in a move seen as a gesture from the authoritarian leader of Belarus to improve relations with the West. Ales Bialiatski, the 51-year-old leader of the Vyasna rights group, was released nearly three years into his prison sentence, 20 months ahead of schedule. Bialiatski was nominated for the Nobel Peace Prize in 2012 and received an array of international awards while imprisoned, including the U.S. State Department's 2011 Human Rights Defenders Award. His group has provided legal assistance to thousands of Belarusians arrested or imprisoned for challenging President Alexander Lukashenko's undemocratic policies. He was convicted of tax evasion and sentenced to 4 years in prison in November 2011. Western governments criticized the trial as politically vindictive. Supporters greeted Bialiatski at a train station in the capital, Minsk, after he traveled from prison in the city of Bobruisk. "The international support and the support back home, this is what brought about my release," Bialiatski told reporters. "I will continue to do what I've been doing." Bialiatski said he was treated "badly and brutally" in prison, including regular periods of solitary confinement. Rights advocates say six people remain in prison for political activism, including former presidential candidate Nikolai Statkevich. Lukashenko and his associates were slapped with international sanctions in reply to their crackdown on opposition figures. Analysts say Beliatski's release could reflect Lukashenko's wish to mend ties with the West at a time when Belarus is at odds with its longtime partner, Russia, over the conflict in Ukraine. Lukashenko has been dismissive of the Moscow-backed idea of autonomy for Ukrainian regions and instead backs Ukrainian unity. Unlike Russian President Vladimir Putin, Lukashenko has maintained ties with Ukraine's new government and attended the inauguration of the new Ukrainian president. "Lukashenko is giving a strong signal to the West that he is willing to improve relations," said Minsk-based political analyst Alexander Klaskovsky. "Lukashenko is showing that he does not want to be dependent on Russia." U.S. State Department spokeswoman Jen Psaki welcomed Bialiatski's release, calling it "a positive development," but reiterated the call for Belarus to immediately release all political prisoners and restore their political rights. "These actions would pave the way for normalization of relations between the United States and Belarus," she said in a statement. "We stand with the people of Belarus and reaffirm our readiness to help them build a democratic, prosperous, and truly independent European state."